Wild Mallard ducks are the predecessors of all domestic ducks, except the Muscovy ducks. Because Mallards are heavy-bodied and short-winged, they are hardly able to fly unlike their Muscovy counterparts. Being the most abundant and common of all ducks all over the world, they are sometimes fondly called dabbling ducks or puddle ducks because of their sheer love of water ponds, lakes, and marshes. A Mallard lives three times longer in captivity than it does in the wilds. This is a compliment to the people who take care of it, for domestic ducks are as much as part of every homely farm or barnyard setting. Full-grown wild Mallards would be around two feet in height and three pounds in weight. A mature female at 10 weeks of age has a loud, sharp quack which overpowers the soft, muffled sounds of the male drake. A female is adorned with purple-blue feathers and an orange bill, while the male is predominantly grayish brown with a greenish head and a lighter yellowish bill. The male comes into his own at maturity when he develops a distinctly curled drake feather on top of his tail. However, during the summer, Mallard drakes molt and change their feathers which make it difficult to identify them from the females. If any duck can put on a show, it would be a wild Mallard drake. During the fall, the mating ritual happens on the water with the drakes hooting and whistling and the female ducks spurring them on with hooting and waddling. By winters, mating pairs have formed and they migrate North where they breed, and build nests. The romance is short-lived as the Mallard drake doesn’t stick around after the eggs are laid. A Mallard drake wants no part in all the nesting and brooding. 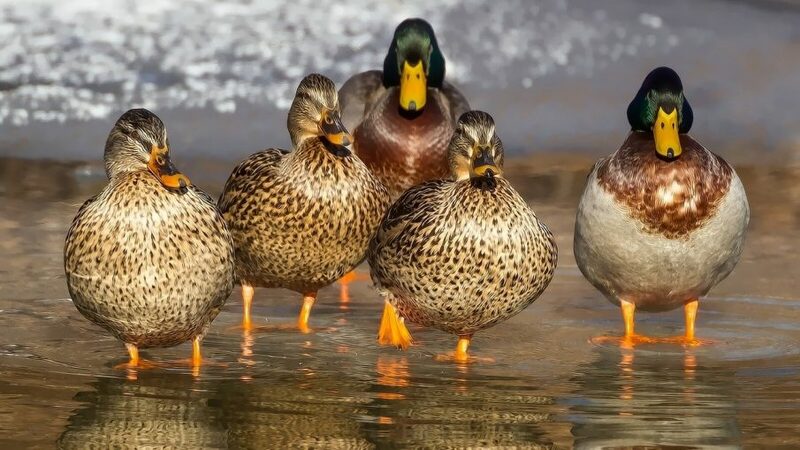 Should ducklings be left without both parents, the best way for raising Mallards would be in the company of other ducklings as they get older. Another alternative would be to place the duckling under a brooding duck at night, hoping she’ll come to accept and raise the orphan duckling as her own. When raising wild Mallards, the Mallard mother duck lays an average of 12 eggs with every nesting. Close to water, she lays them one at a time daily or every other day and only starts to sit on them when they’ve all been laid. It takes 28 days for each wild Mallard egg to hatch. The process can be facilitated by using a heated lamp without overheating the eggs. Young ducklings are cooped up at first for their own protection and safety from predators. The baby ducks can be confined in a corner of the room or barn, allowing them more space as they grow. At around five weeks old, wild Mallards start to swim and will prefer the outdoors. They’re equipped with a functional bill for feeding and grazing and webbed toes feet for swimming and paddling. Domestic ducks eat practically anything as omnivores, but they love plants like leafy greens and will even give mollusks, slugs, and insects a bite or two when they’re hungry. The wonderful thing about raising wild Mallard ducks as pets is that they will follow you around anywhere you go and will welcome you home with frantic, excited quacks. And although they can’t fly, their antics will make your heart soar with pleasure.